With a large part of Indigenous nations’ territories and resources in what is now the United States taken through aggressive war, outright theft, and legislative appropriations, Native peoples have vast claims to reparations and restitution. Indigenous nations negotiated numerous treaties with the United States that included land transfers and monetary compensation, but the remaining Indigenous territories have steadily shrunk due to direct federal appropriation by various means as well as through government failure to meet its obligation to protect Indigenous landholdings as required under treaties. The U.S. government has acknowledged some of these claims and has offered monetary compensation. However, since the upsurge of Indian rights movements in the 1960s, Indigenous nations have demanded restoration of treaty-guaranteed land rather than monetary compensation. Another important form of reparations is the repatriation of remains of dead ancestors and burial items. After considerable struggle on the part of Indigenous religious practitioners, Congress enacted the Native American Graves Protection and Repatriation Act of 1990 (NAGPRA), which requires that museums return human remains and burial items to the appropriate Indigenous communities. It is fitting that Congress used the term “repatriation” in the act. Before NAGPRA, the federal government had used “repatriation” to describe the return of remains of prisoners of war to foreign nations. Native American nations are sovereign as well, and Congress correctly characterized the returns as repatriations. Few people in the Western Hemisphere have shorter life expectancies. Males, on average, live to just 48 years old, females to 52. Almost half of all people above the age of 40 have diabetes. And the economic realities are even worse. Unemployment rates are consistently above 80 percent. In Shannon County, inside the Pine Ridge Reservation, half the children live in poverty, and the average income is $8,000 a year. But there are funds available, a federal pot now worth more than a billion dollars. That sits here in the U.S. Treasury Department waiting to be collected by nine Sioux tribes. The money stems from a 1980 Supreme Court ruling that set aside $105 million to compensate the Sioux for the taking of the Black Hills in 1877, an isolated mountain range rich in minerals that stretched from South Dakota to Wyoming. The only problem: The Sioux never wanted the money because the land was never for sale. That one of the most impoverished communities in the Americas would refuse a billion dollars demonstrates the relevance and significance of the land to the Sioux, not as an economic resource but as a relationship between people and place, a profound feature of the resilience of the Indigenous peoples of the Americas. Excerpted from An Indigenous Peoples’ History of the United States by Roxanne Dunbar-Ortiz (Beacon Press, 2015). Reprinted with permission from Beacon Press. The us govt stole many lands from not only the souix but many others even the most peaceable tribes such as the nez perce of oregon..they didnt have any right to do this..the indians wanted peace but the govt created war n stole n coerced lied mamed and murdered many tribes and chiefs..including sitting bull who they murdered. The govt enslaves all races with there tyrannical behaviors..ie the african american the chinese man who built the railroads n the kidnappin and false imprisionment of the japanese..for purpose of soiled doves at the ages of nine uears old as a female. Our govt are liars,con artists thieves and treasonous murders that are well know as the worst criminals ever.. may the great spirit see to blessing the souix nation and all indians that the govt stole from there lands back forever .. the us govt makes alot of laws it never follows thru on.. you reep tenfold what one has sown..the indians will eventually win this war of thievery coercian and illegal duress against the crooked govt of the usa.. i agree with the indians of the souix nations retun there lands free of charge now it is long past due for justice for the indians!! !We forced our religion our ways n culture from the indians we made them dress walk talk like europeans..and we forced there children to go to boarding schools cut the long hair and forced them to be europeans..it was very horrific cruel and very very coercive n evil!!! No, it isn't over and done with. Either the US strives to be a Nation of Law, based on the US Constitution, and not just honored more in breach, than reality, or and no David-we are talking about Law here, not what you think happened prior to the Lakota-US Treaties. And that is what the USA violated, it's own Constitution and Laws. For prejudice, gold, and based in Papal Law. The USA can do better than that. Get over it? Then get over 9/11, Pearl Harbor, The Holocaust! If over 100 million of your ancestors were outright murdered via genocide, how quickly would you get over it? Will the Sioux give it back to the Cheyenne, who had it before it was taken from them by the Sioux? 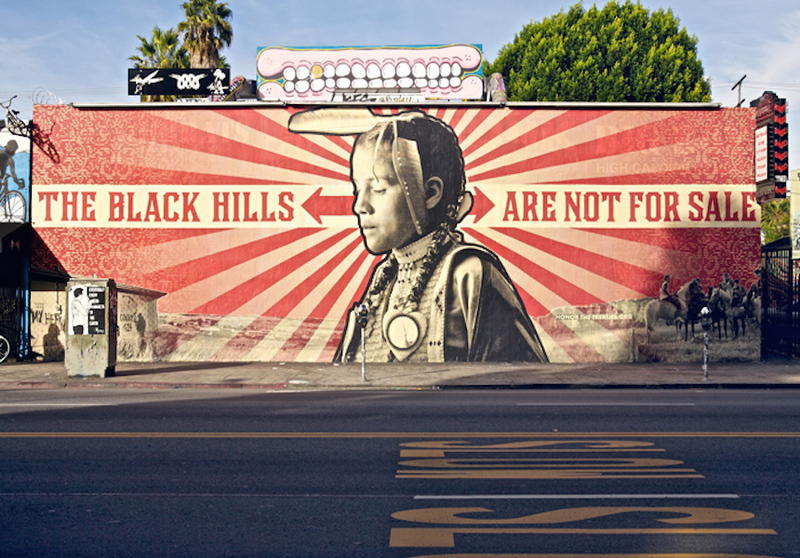 It will never be forgotten, and no amount of $$$ will ever be enough to cause the Lakota to give up the Black Hills. Never. They are like Jerusalem to the Jews, like Mecca to the Muslims. "Get over it"? No. OH! if it were only true. I propose the USA declare war on those foreigners today! I am so tired of educated people using bigotry and tribalism, because it might get um a buck. Other countries are paying reparations for what happened to their indigenous peoples; why not the US? Don't those people deserve it? It's all over and done. Get over it. I didn't do it, and it didn't happen to you. Do what you can with what you have. At least now there are laws to help.